…for my solo show at Anne Hunter Gallery in Seaside, Florida. Please come to my show opening on October 5th from 5-8 p.m. 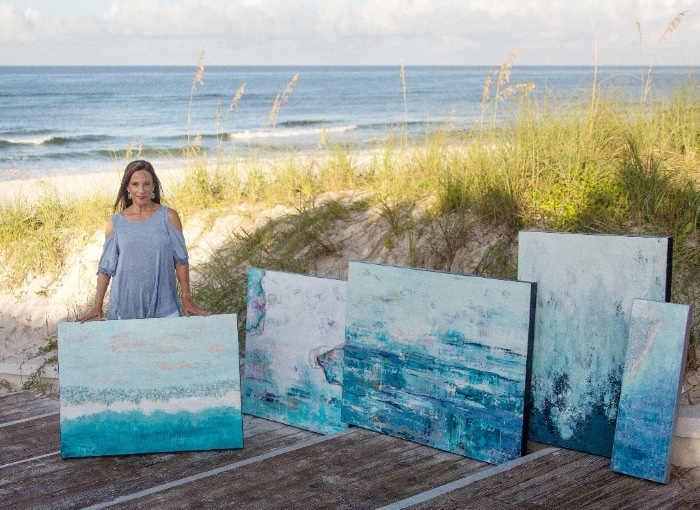 I will be debuting my new “Coastal Senses” series which represents my interpretations of the touch, taste, smell, sound and visions of the beautiful Gulf Coast where I spent much of my youth growing up. The show will run until December 31, 2018. I am so excited to share this collection with you! Please stop by Anne’s gallery at 25 Central Square in the heart of Seaside. 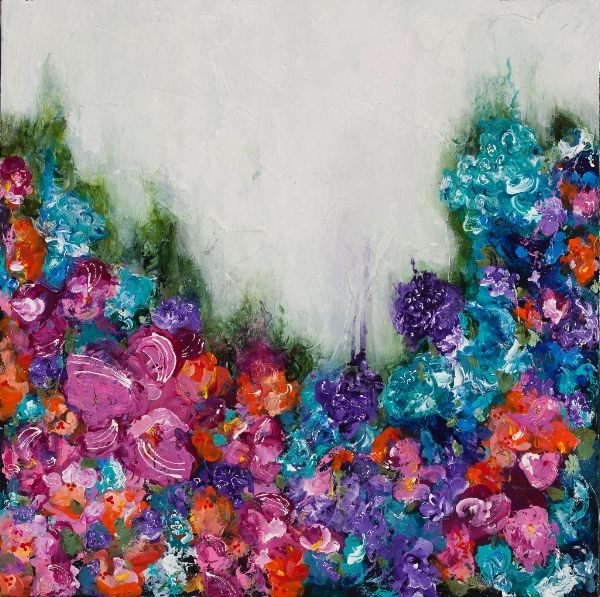 For purchase information, contact Anne Hunter Gallery at info@annehuntergalleries.com. I am currently taking commissions for the fourth quarter and holiday season. Original art gifts are the best! My calendar is limited, so book yours early. 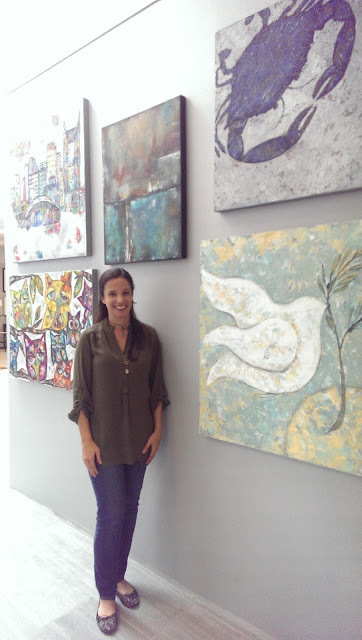 I recently journeyed to the Webb School Artxtravaganza show in Knoxville. It was a delightful show and weekend as I made new friends and saw familiar faces. My beach series went over well and my Grayton Beach painting found a home in Knoxville. My Land of Cotton series and Tree of Life series were quite popular too! The best part was new friendships made. 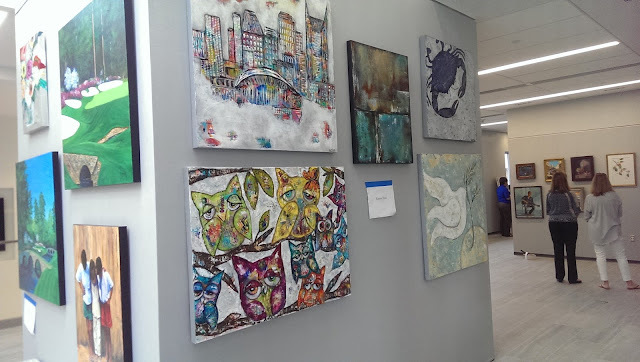 Connecting with other artists is one of my favorite parts of art shows. I will be busy in the studio preparing some commissioned pieces and new work for the spring! Stay tuned. I have been working hard on a lot of new pieces for my upcoming shows, including a beach series which is a nod to my upbringing along the Florida panhandle. I hope to meet you and share with you my new work! Every August brings heat, a new school year and yes, Nashville’s Tomato Arts Fest. I love this festival. It takes place in the funky, kind of artsy area of East Nashville. The people are fun. The whole community seems to participate ~ although they kind of have to since all the vendor tents are in front of their homes! There is a run, a parade, a doggie fashion show, live bands, every kind of tomato you can think to eat and yes, ART! 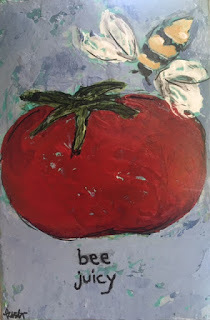 Even fun tomato art. A couple pieces of tomato art to celebrate the day! Parade festivities beginning…everyone in red and many in costume! Pets and children welcome. My booth set up. It was a new configuration for me, and I think it worked well. This lady bought my piece, “Becoming Free”, because she was so moved by it. She works in Africa and was just visiting home, but it will become part of her permanent home. A birthday gift to herself for her new home and a celebration of five-years being cancer free, this customer was a joy to talk to! I love meeting my customers. If you live local, and have not been, you must come out next year. I promise two things, you will sweat and you will have fun! Thank you for all who came out and met me for the first time ~ I enjoyed meeting you and sharing my art with you for a moment. Next week Fireflies, Spring Hill’s premier gift boutique will be hosting their Holiday Open House. This year each vendor is offering custom-made gifts and items “ready-to-go” for your shopping ease! I will be taking orders for my popular 4×6″ angel canvases. If you come that day, you will have an opportunity to order your own angel ~ customized. Whatever hair color, hair style, skin tone, or canvas color scheme. You can even pick a bible verse, if you want, for me to add at the bottom of her dress. Here are some photos of how my angels look. 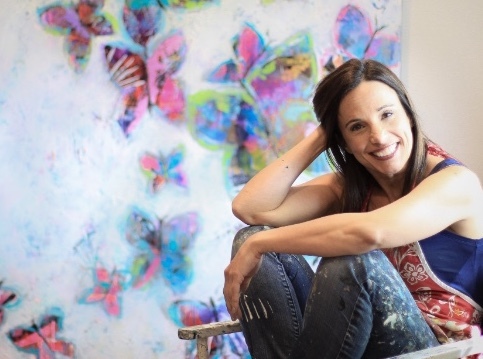 Original angel artwork canvases are perfect gifts for friends, mothers, daughters, sisters, grandparents, caregivers, teachers, mentors and co-workers. Each piece will be signed and come wrapped with a note saying it was custom-made especially for them. What a one-of-a-kind gift! And for only $38 plus tax (and shipping if not local). Can’t make it to Fireflies? Contact me directly via email (kirstenreed@yahoo.com) and I will send you a custom order form to fill out. All orders must be placed by December 12, 2015 in order to be ready for local pick up by December 23. If you are in the market for a new piece of art, you won’t want to miss Montgomery Bell Academy’s art show Sept 13-26. There are more than 40 very talented artists in a variety of different mediums showcasing their pieces. I am so blessed to be included among them. The show will kick off Sunday, September 13 from 5-7pm in the Davis Building. I hope to see you there!